Just four months after the Empire State Building was dedicated in May of 1931, Spokane’s own art deco gem opened in gala fashion. The grand opening featured five Hollywood stars and drew a crowd of 50,000 star-struck spectators who lined the streets in downtown Spokane. Over the next 60 years the Fox Theater held an important place in local culture. But time brought change. In the late 1960s the Fox became the main venue for the Spokane Symphony. In the mid-1970s the poured concrete building, with its elaborately decorated interior was split into three minicinemas. In 2000 the theater closed and was slated to be demolished before it was purchased by the Spokane Symphony. Now, with a multimillion dollar restoration on the horizon, the hunt is on for the theater’s missing treasures so they can be returned to the shuttered building. In light of the remodeling and other changes wrought by the years, Spokane’s 1931 Art Deco showplace is remarkably intact. But as modifications and improvements were made, furnishings, light fixtures and other items were taken down and discarded or put away. A few things simply disappeared. Grainy photographs of the theater’s original interior show deep, luxurious sofas and chairs lining the hand-painted walls of the main lobby. The rooms were illuminated by elaborate light fixtures, including stylish wall sconces and nine large chandeliers that hung from the ceiling of the auditorium. Heavy etched glass panels mounted between stylized cast aluminum railings framed the mezzanine and stairway. These are the things that Betsy Godlewski, development director of The Fox, the nonprofit group overseeing restoration of the building, is looking for. She wants to bring them home. Godlewski leads tours through the sleeping building each Wednesday. She points out the detail in the murals designed by Hollywood’s Anthony Heinsbergen, noting the intricacies of the aquatic-themed decor which moves from sinuous underwater plants painted on the main level to the clouds and castles painted on the walls of the mezzanine. Godlewski also points out the enormous fan, part of the original equipment used to cool the theater, the first air-conditioned building in Spokane. Moviegoers could see the inner workings of the cooling system through a large observation window as they passed the building. “Can you imagine how impressive that was at the time?” she asks. The Fox has already invited the public to submit fond memories of the theater, but they’d also like to get their hands on souvenirs of events held there. Posters, playbills, ticket stubs and other ephemera are among the items the theater wants to reclaim, as well as fixtures. Harlow Gibbon is one of those who shared his experiences at the Fox. Gibbon was on the train that brought the stars from Hollywood to Spokane for the grand opening of the theater in 1931. At 85 Gibbon’s voice still swells with excitement when he recalls the thrill of standing in the throng as the stars leaned over the marquee and waved to the crowd. Gibbon went on to work as the doorman of the theater when he was 19. He wore a forest green uniform decorated with large gold buttons and his first night on the job was the night “Gone with the Wind” premiered in Spokane. 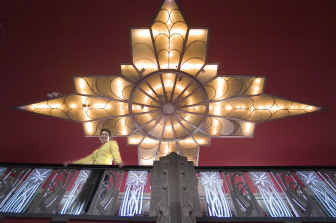 Gibbon fell in love with the beautiful art deco building and it’s glamorous interior. He describes the furniture in the lobby area as magnificent. Using the stories of people like Gibbon and other members of the community, and their souvenirs as well, Godlewski hopes the theater will be able to reclaim its former glory. A donor has already brought the original sidewalk poster stands back to the theater, but Godlewski and crew would like to get their hands on so much more.